One of the main ways I show my love is through cooking something yummy for the people I care about. If you’re reading this, most likely you feel the same. When I was living on my own, the meals I prepared for my single-self were a little different from the ones you see here on the blog. Chicken-sausage from TJ’s and tortellini with wilted spinach was a go-to. There were always healthy hippie salads tho – I was obsessed with this one for a long time. And pretty much grew up eating some version of this. But I had never heard of tempeh or attempted to make a veggie burger so when I met Mark (aka: the 20+ year-long veg-eating (yes that means he doesn’t even eat chicken) super-sweet southern boy) I was scrambling and also soooo in love, but also freaking out. I wanted to cook him something delicious – but it couldn’t have any meat in it so how was I going do that?! Enter: food blogs! Thank you internet! One of the very first blogs I discovered was seven spoons. 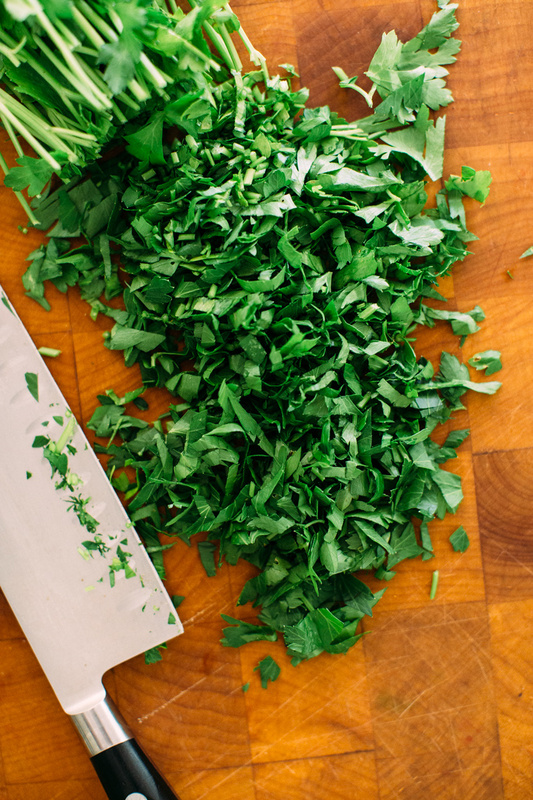 Tara’s blog wasn’t strictly vegetarian but her recipes inspired me and resonated with the way I like to cook – lots of flavor, fresh herbs, spices – just delicious real food. So after years of following her blog of course I had to get the cookbook! 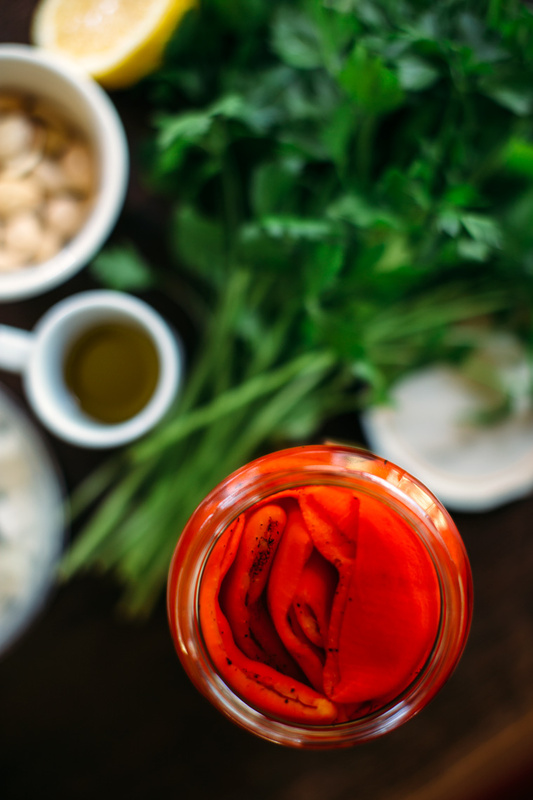 Within moments of receiving it I had already earmarked many recipes: Roasted Carrots with Harissa Aioli and Dukkah (which I made the very next day – they were amazing!) Baked Eggs, North Indian-Style, Halloumi in Chermoula, Everyday Yellow Dal, Green Chutney made with granny smith apples and limes (I made this one too – sooo good!). 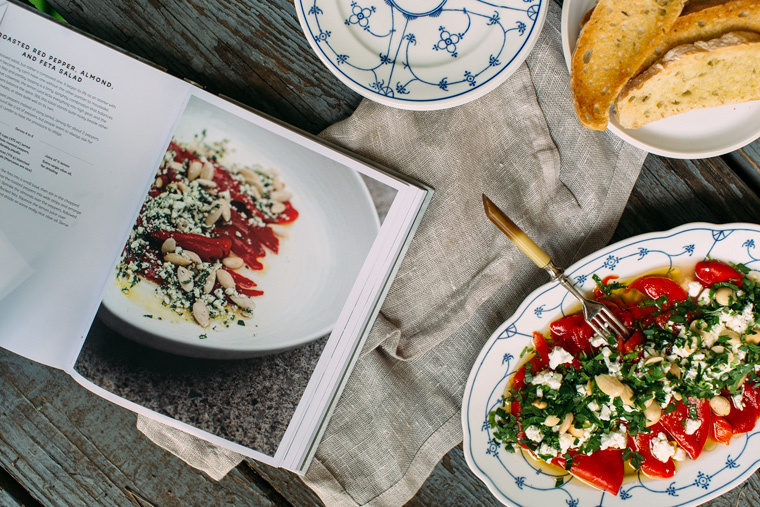 The recipes in this book are crowd-pleasers for sure, recipes you’ll want to make and share with friends. Long, lingering dinner party recipes where every little dish placed onto the table is better than the one before it. And the lovely part is they’re not complicated dishes – if some require a bit more explaining, Tara talks you through each little step, encouraging you and giving you options for substitutions along the way. 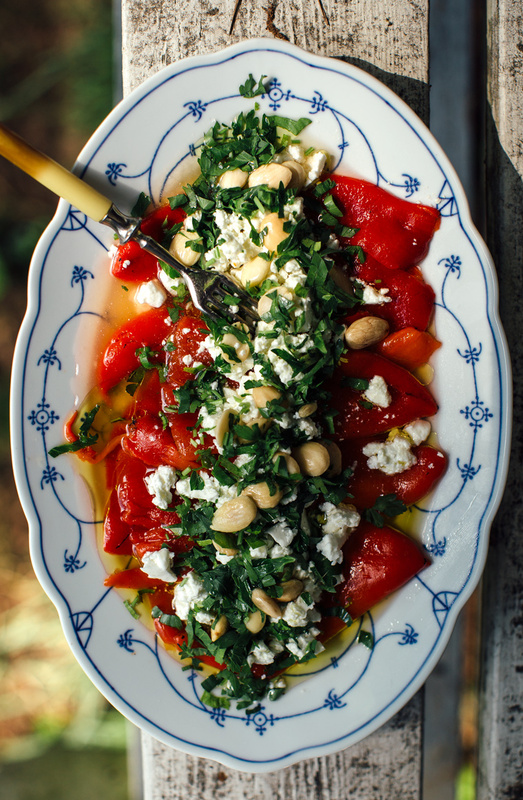 Today I’m sharing this very simple but extremely delicious Roasted Red Pepper, Almond and Feta Salad. 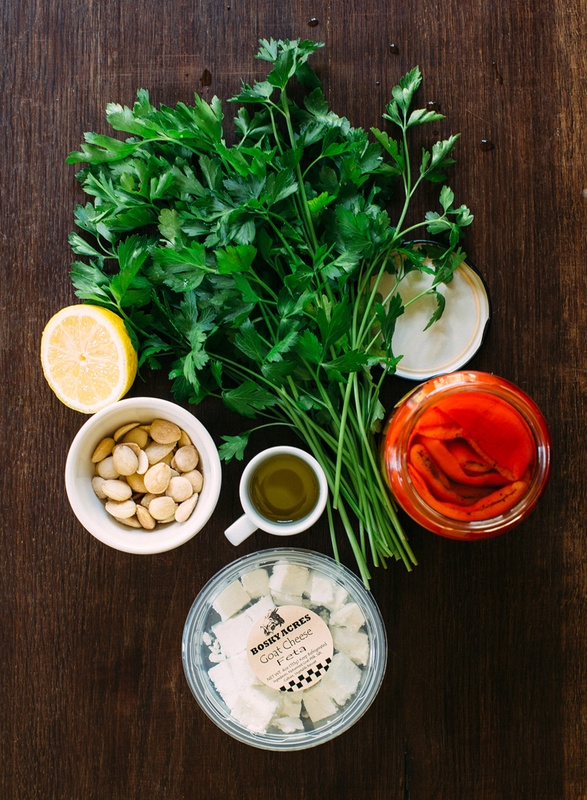 With so few ingredients, please be sure yours are of the best quality. 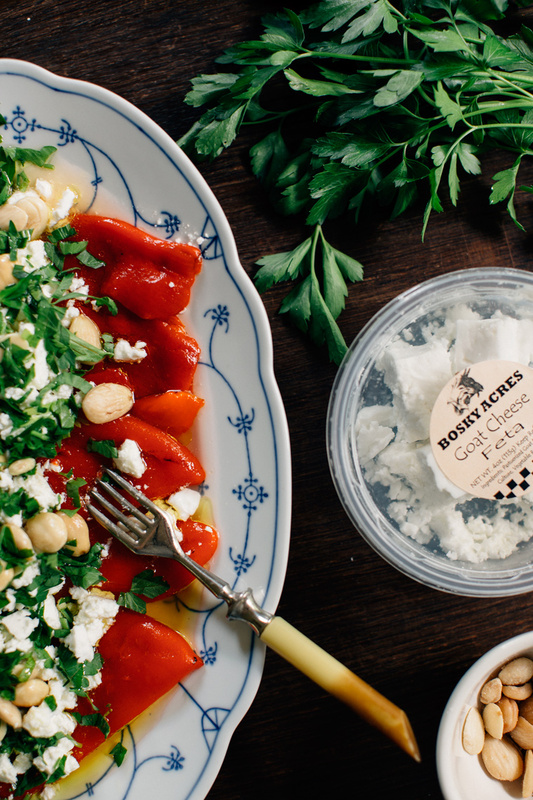 I used goat’s milk feta from Bosky Acres local goat dairy farm. 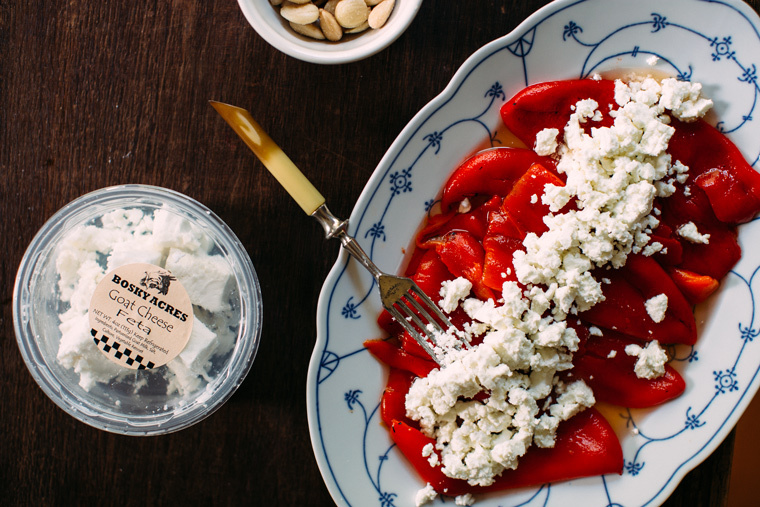 Their feta is awesome – mild, creamy with a little tang and not overly salty like the store-bought stuff. Don’t buy the already crumbled stuff with powdered cellulose on it – get the good stuff, it’s so worth it. I will keep this recipe in my back-pocket forever. It’s the perfect thing to serve impromptu guests – accompanied with a nice crisp white wine and some toasted baguette or ciabatta on the side. Cheers Tara! I love your book! 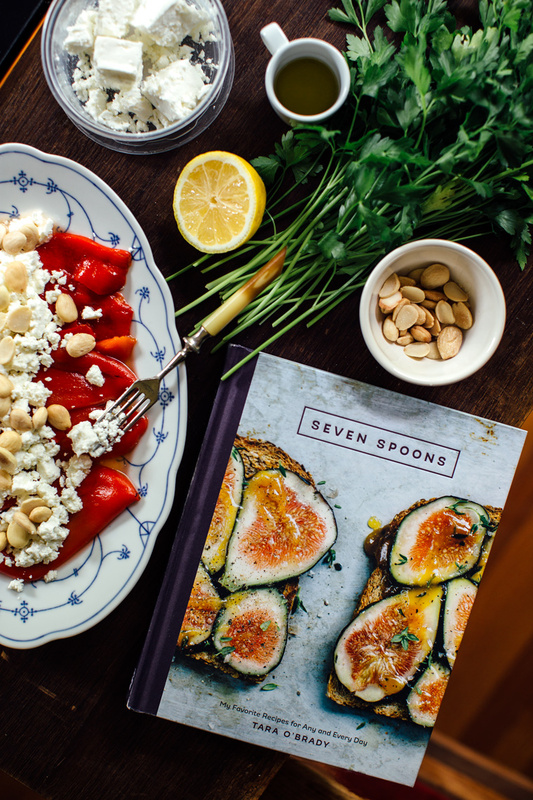 For more #sevenspoonscookbook recipes, check out these lovely posts! Slice the (drained) roasted red peppers into strips. Place on platter. Crumble feta over the peppers, next add the chopped parsley leaves and almonds. Squeeze the lemon juice over everything. 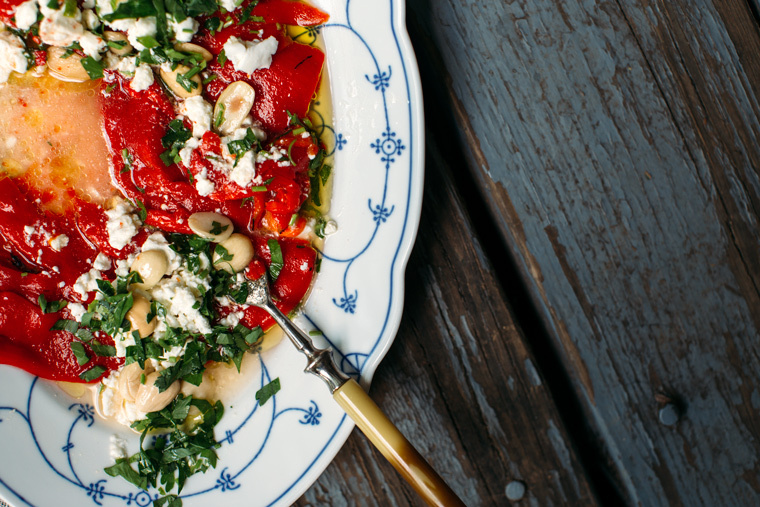 Drizzle with your best olive oil. 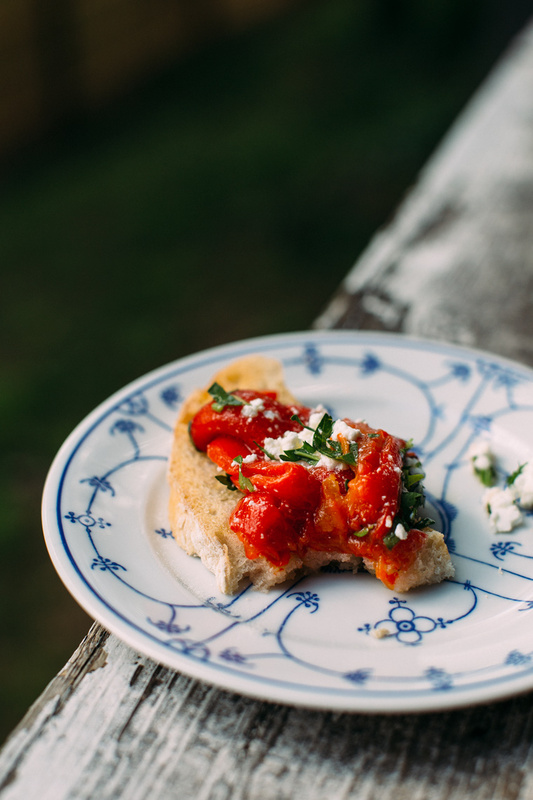 Serve with toasted ciabatta – optional. This post was sponsored by Bosky Acres. All opinions are always my own. I loved this cheese and if you’re a goat cheese fan living in the Charlotte area you should totally check them out! Here’s where you can find them: Bosky Acres Goat Cheese can be found at 4 local farmers markets: Charlotte Regional Farmers Market (Saturdays and Tuesdays), Matthews Community Farmers Market, Union County Farmers Market Monroe, Waxhaw Farmers Market, as well as Earthfare, Queen City Pantry and on the menu at many local farm-to-table restaurants like: Heritage Food & Drink in Waxhaw, Rocksalt, Fern and 300 East. Check out their Facebook page to see where they’ll be! Oh AND they’re building a cheese cave right now so they’ll be offering harder, aged cheeses really soon! Hanging out in a cool cheese cave sounds like a pretty fun summer activity if you ask me! Plus, aren’t baby goats the cutest?! Recipe from the Seven Spoons cookbook. I received a copy of this book in exchange for an honest review. I made this salad over the weekend too! (and have just put the leftovers in the fridge at work for my lunch later). It’s super delicious isn’t it? and I love your gorgeous photographs. Oh my goodness, all of her recipes sound so, so good. This salad is so bright and fresh. It is the perfect solution for those warm summer evenings when you need something quick and tasty to pull together.